The best car rental Liberia in a moment – click the search form! Breath in the air of the tropical forests – welcome to Liberia! Exploring beautiful sandy beaches with car rental Liberia is easy now – complete the car hire form and get your dream rental car at the cheapest price ever! Passing through the picturesque natural areas Liberian roads rarely have an asphalt surface, usually these are very narrow and winding dirt roads. The main kind of transport here is a SUV car able to drive through the rain-drenched dirt roads. Be ready for extreme driving! Souvenirs – soapstone, safari clothing, batik, kanga and kicka, painted ostrich egg, drum, national dress, African masks for ritual dances, geranium tea, rose syrup. Traditional food – Dumboy, Foo-foo, Country Steak, fish in coconut cream, Liberian white bread, ginger beer. 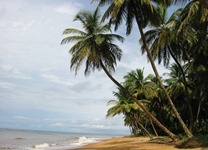 Add the services of the most reliable car rental in Liberia to your vacation plan!